This land was part of the vast Black Rock Estate that stretched from Warrens to Holders. The Holders were a prosperous family of Barbados landowners in the 17th and 18th centuries, and the surname survives as a very common Barbadian name. Holders sugar plantation was operative until the mid 60's, and was then owned by the Hon. Janet Kidd. Her son, Johnny, got interested in polo, and encouraged his mother to let the Barbados "Polo Club have a field at Holders. At first she leased it, and then sold it to them for the nominal sum of Bds. $24,000, with a covenant that the field can only have equestrian sport on it. Her generosity was matched by her business acumen; she developed the land around the field and the results are what you see today. With its atrium and open walls, Ker Avel blurs the line between indoor and outdoor living. Avel means breath and here you'll almost feel the house inhaling the breeze. 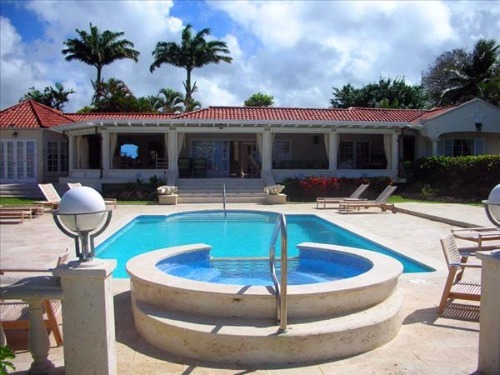 Ker Avel Barbados was built using local coral stone, red clay roof tiles, and pickled pine ceilings. When the current owners bought it, they asked Jenny Blanc to rethink the interior as a place where friends and family - including young children - could relax, Caribbean style. If this meant minor structural changes (and it did), then so be it. Jenny Blanc and her Barbados born design partner, Sue Thomas Richardson, got busy defining functional spaces that flowed into one another. A new marble floor was installed throughout he property, and walls were either given apertures or put up where a solid embrace was needed. 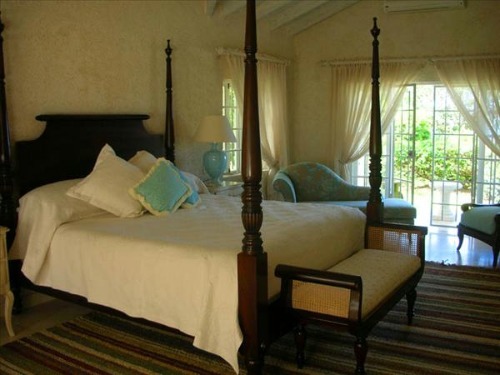 Appreciative of traditional plantation style, the owners were keen to incorporate original antiques from the island. You will see some of these as you enter the foyer and central courtyard, though your eye might first go traveling through the atrium and surrounding areas, then out to sea. 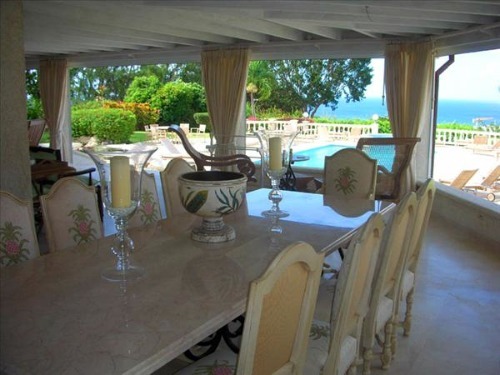 It was in Barbados that the design team sourced the antique settee, tea table, hat stand and a tall table for plants. These would have been crafted by excellent Barbadian joiners who, in those days, skillfuly copied or adapted European design features using the island's fine mahogany . The pieces were restored and French polished, with the settee re-upholstered in a beautiful French Fabric. The Persian rug was sourced through a local dealer, and the polished coral stone console table was custom made by local stonemasons Colin "Top Cat" Alleyne for this spot. To your left is a sunken fish pond which is open to the sky and natural light. To the right, your are now in an informal media and play area whose bay window forms a space for broad banquette seating done in a friendly plaid. Pencil lattice (good to prevent mildew in this climate) covers storage beneath. The whimsical cushion fabric depicts dressed up monkeys in trees. The traditional Berbice or planter's chair has arms that fold out to provide the weary planter with a place to put up his feet. This is a room where changes were made. Where there used to be doors, apertures protected by decorative iron work now look into the next space. A glass door leads down a step into the sun swept breakfast room. Colourful children's chairs at the table give a clue to two of the house's occupants, who are cute enough to be on display themselves! You'll see further evidence of their presence later on. This room is served by a large kitchen in black and white with central island a great workspace. Louvred doors allow air circulation even when doors to the kitchen are closed. 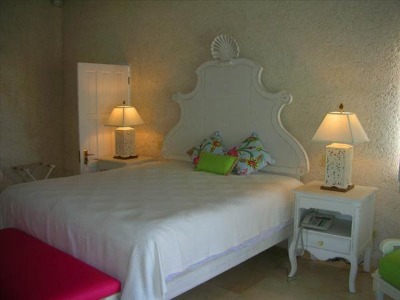 Straight ahead, enter an ample guest room in fresh, bright colours with an inviting chaise longue, and a bed with an inviting chaise longue, and a bed with a scallop shell head board, designed for Ker Avel Barbados by Jenny and executed here in Barbados by Island Furniture. This is the Mother in law's domain, and was decorated to suit her. A little private patio is furnished with a coral stone table and a pair of Adirondack chairs in a chalky green. As if this weren't enough, the ensuite bathroom is spectacular. It has a double vanity with caramel coloured marble atop dark wood, and an alcove shower where little push out jalousies allow you to connect with nature while bathing. A modern update of the old fashioned, footed style, the central tub lets you look up through the skylight and watch the clouds go by as you soak. Now go back through the breakfast room and out to the formal dining area on the veranda. Roll down shutters protect his space when necessary, and creamy draperies can create a coziness, but otherwise it is open to the outdoors. The elegant marble table was custom crafted in Barbados for this space Its base was finished to match the French style chairs. Sourced in America, they are upholstered in a pineapple print. Farther along, two planter influenced chairs on a locally-produced grass rug suggest sitting back with a snifter of fine Barbados sugar cane brandy, and watching the boats drift by in the sunset. Cool, fresh colours with shades of green create continuity from one area to another, including the garden. If we're lucky, the flowers at this edge will be in bloom today they are birds of paradise. Moving to the sitting area, the theme of relaxation continues, with a games table for the bridge players in the family, welcoming couches, and adjustable back chairs. 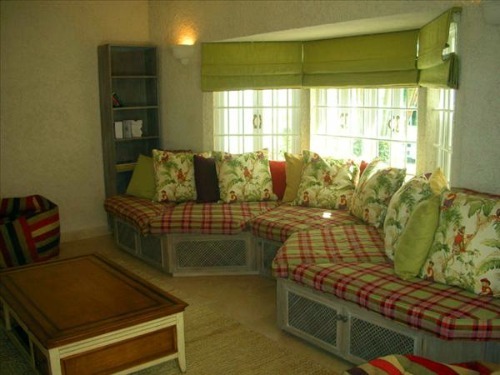 Again, Jenny Blanc Interiors designed the furniture. It was hand carved of pickled ash by Island Furniture. With clever wall sconces made of bird cages? 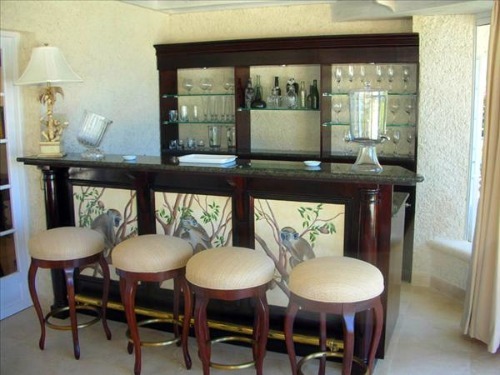 At the far end is a elegant bar, made to order by Barbadian craftsman, Andy Tempo, using the local and now rare mahogany. The handpainted panels depict monkeys in classic hear/see/speak no evil poses. Monkeys are frequent visitors to the gardens of Ker Avel Barbados, but haven't yet stopped in for a drink! Going through the sliding glass doors and to your right, you'll find a gentlemanly office/study space. The antique desk with brass detailing was sourced on-island, as was the double-end couch with its lovely curves and scrollwork. Head back through the central courtyard. Here, a double doorway leading onto the dining area was remodeled as a wall to create a corner for indoor seating that won't be exposed to the elements. Go to the right, into the bedroom wing. To your left, an end bedroom enjoys light and air from three sides. Sourced in France, the bed's headboard uses lattice and scrollwork to good effect, and as usual, the pedigreed fabrics show refined cheer in their colour and pattern. For a good close up view of a travelers palm, look out the south window. Native to Madagascar, this is neither a tree nor a true palm, but a plant in the bird of paradise family! It got its name (at least the travelers part) because the sheathes of its leaves catch water which can be used as an emergency supply. Go back and on your left you'll see a nursery/playroom with a rubber puzzle rug to protect little bodies from falls on the hard floor, and two playpen beds. Next is a room which was could later serve as a private sitting area for the master bedroom, but which now is perfect as the babies' room, conveniently close to their parents. The master bedroom itself is quite grand in size, and its centerpiece is a mahogany four poster bed with traditional barley twist posts, another locally commissioned piece. Two chaises provide comfortable seating, which is so important in making a sizeable room feel relaxing. An impressive bathroom is attached. 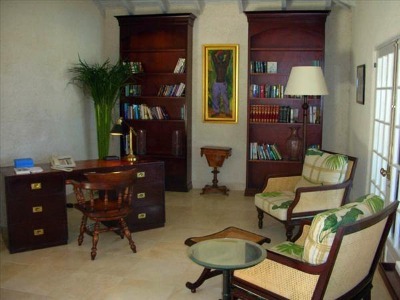 Jenny Blanc Interiors has won four awards for its work in the Caribbean including the World's Best Interior Design at the International Property Awards 2007. 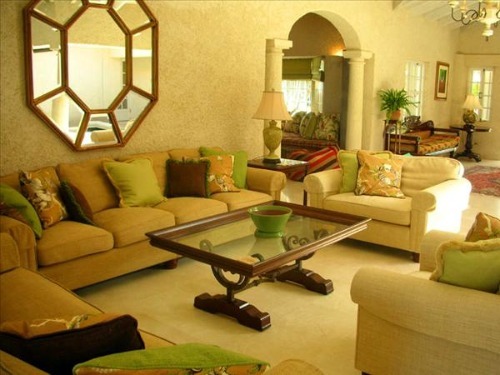 For Ker Avel Barbados, the company won the coveted award for Best Interior Design Caribbean in 2008. Jenny plans to open a lifestyle showroom on Barbados in early 2011. A walk through the grounds reveals, among other things a Bajan evergreen, miniature bamboo, mahogany trees, and a bright macaw parrot under a flamboyant tree. Please do not put your fingers in its cage. Nobody but you is responsible if you get bitten! There is also a pool with a Jacuzzi, and a barbecue pavilion. Bougainvillea provides a thorny barrier at the rear of the grounds. From here is a nice view of the house. If you wonder about the panels on the roof; these are passive solar water heaters, a common feature in Barbados.